ANIMAL NATION DOESN'T KNOW ANYTHING. 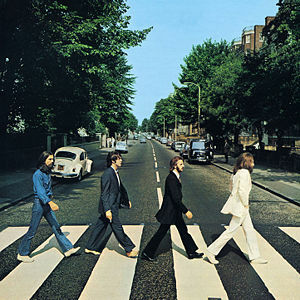 : Albums of Influence - The Beatles' "Abbey Road"
Albums of Influence - The Beatles' "Abbey Road"
Everyone's heard of the Beatles before. I'm sure everyone's heard the Beatles as well. I think the first time I heard the Beatles was in Elementary school, when the entire class learned to sing "Yellow Submarine". Abbey Road, however, was the first time I can remember that I actually listened to the Beatles. I remember the first time I put it on, that first bass note and flanged vocals on "Come Together" were so magnetizing that I couldn't help but be sucked in to whatever else the album had to offer. The most influential part of this album for me however, came after the flip. Nearly the entire second half of the album was blended together to create an epic 15 minute medley. This was the first time I had ever heard multiple songs, that all sound completely different, flow together seamlessly as if they had all been recorded in one take. I've never been a huge Paul McCartney fan, but for the fact that he spent hours and days and weeks literally cutting up tape, and splicing it back together, completely without the assistance of Pro Tools, you've gotta give him props. That, and he also invented sampling. Download the entire album for free here. Then make sure to head out and buy buy buy all the Beatles memorabilia you can possibly get your hands on. Other great Beatles albums include Revolver, The White Album, and select songs from Sgt. Peppers.